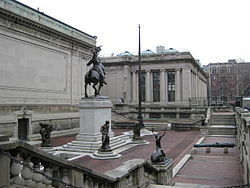 The Hispanic Society of America is a free museum and reference library for the study of the arts and cultures of Spain, Portugal, and Latin America located on Audubon Terrace. The Society offers a comprehensive survey of Spanish painting and drawing from the Middle Ages to the present, with particular strengths in that of the Spanish Golden Age (1550-1700), the nineteenth century, and the early twentieth century. Mr. Huntington’s interest in Spain’s past led him to sponsor many archaeological expeditions and excavations throughout the Iberian peninsula and Latin America. Through these excavations and subsequent acquisitions, the Hispanic Society has been able to assemble an important collection of antiquities. These pieces offer a comprehensive history of Spain’s past from the Bronze Age to the period of Roman rule and include Ibero-Phoenician ivories from the 7th century B.C., as well as Roman silver, glass, mosaics and statuary. In addition to the Ancient and Classical pieces, the Hispanic Society collection contains a significant selection of Islamic and Christian sculpture dating from the Middle Ages to the early twentieth century. The comprehensive collection of textiles, one of the finest in the world, attests to the richness of this art in the Iberian Peninsula from the Arab rule to the early twentieth century. The collection contains magnificent examples of Hispano-Moresque gold, silk, and satin brocades from the thirteenth through the fifteenth centuries. The Hispanic Society also possesses an outstanding selection of rare carpets from Letur, Alcaraz, Cuenca, and Las Alpujarras, as well as lace and embroidery from the fifteenth through the nineteenth centuries. Limited metered parking on Broadway. Free parking on 155th Street between Broadway and Riverside Drive (check signs for alternate side regulations). There is a parking garage on 153 street between Broadway and Riverside Drive. Our expansion plans include 100% wheelchair accessibility, but at present access for people in wheelchairs is extremely limited. Please contact us at 212-926-2234, ext. 209, to discuss any accommodations we may provide to address your special needs. Umbrella strollers are permitted on the first level of the museum in the Main Court and the Bancaja Gallery. Visitors with strollers must first check with the information desk for a stroller pass. Strollers must be folded and checked in the coat room in order to visit the other parts of the museum and library. Larger strollers and strollers that do not fold may not be brought into the museum.